A Jewish wedding day is thought to be the happiest and holiest day of one’s life. Jewish Wedding Photography New York combines cultural traditions and religious rituals with the sights and sounds of the buzzing, vibrant city. 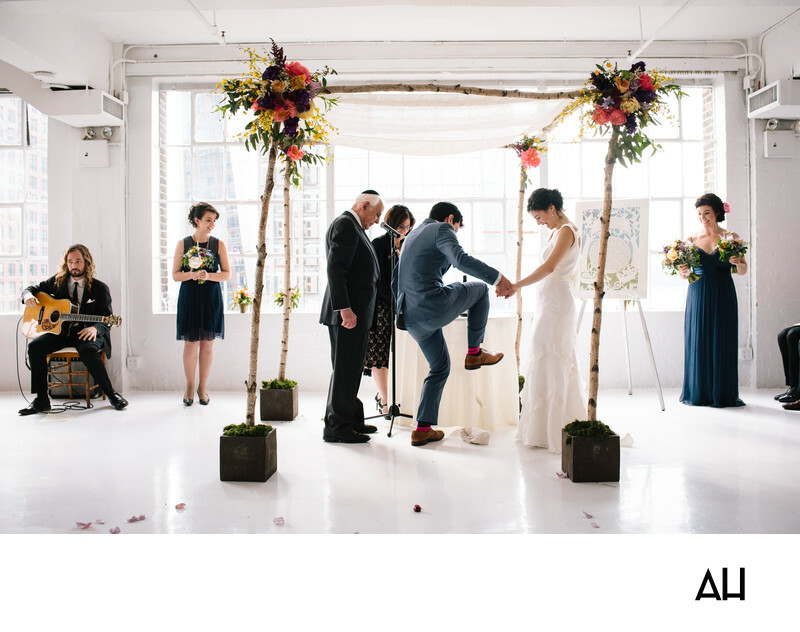 The space that held this wedding ceremony and reception, Studio 450, is a venue that provides for exceptional Jewish Wedding Photography New York. Studio 450 is an event loft space set high above the streets of NYC. The area provided for weddings is set in a open penthouse, with wide windows that give guests a dramatic view of the skyscrapers soaring up around them. The couple used Studio 450 first as a place to hold their marriage ceremony during the day. In keeping with Jewish Wedding traditions, the bride and groom were wed beneath a chuppah, or a canopy. The chuppah is creatively made with four tall, thin branches, adding a touch of nature to this city venue. The four branches that hold up the canopy are secured in plant pots. At each corner of the top of chuppah, varying types of flowers in colors of yellow, purple, and orange spring into the air. A plain white cloth makes up the rest of the canopy, and gives the scene an ethereal air. At this point in the wedding ceremony, the groom must stomp on a glass. The most common reason attributed to this ritual is that the broken glass represents the destruction of the Temple in Jerusalem in the first century. It is meant to be a reminder to cherish each moment, and the groom’s zeal in putting his foot down on the glass wrapped in a napkin, makes the tradition a bit more joyful. This instant of celebration and ritual is just a precursor of the magic that is about to unfold as the venue will switch to a reception space. The bride and groom will continue the day as husband and wife, dancing together as the city lights shine in the windows and light up the night.